I moved to Georgia from Boston when my husband retired from baseball. 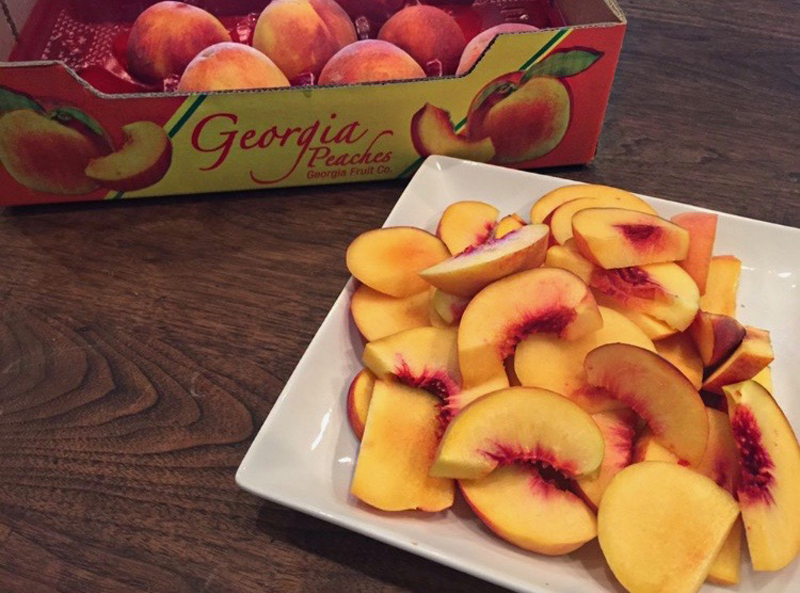 Georgia is known as the “Peach State” because it produces some of the country’s finest specimens…peaches! Georgia peaches can arrive as early as the beginning of May in a good year. I’ll be sharing some of my favorite recipes that include this sweet and juicy fruit as we get closer to its peak season. During one of our many visits with my sister-in-law in Orlando, she took me to this little shop, The Olive Pantry. There they fuse the finest olive oils and kinds of vinegar with beautiful herbs and spices. We spent about an hour sipping wine, learning about oils, and pairing them with perfect fruits, meats, and even desserts! Of course, I left with 3 bags full of oils and vinegar. My favorite one was the White Peach Balsamic. I used it to make a vinaigrette and give a little twist to the traditional Italian classic, the Caprese salad. In a small bowl, whisk all ingredients together until fully mixed; chill until ready to use. 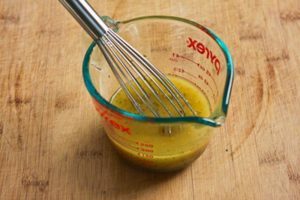 This peach vinaigrette makes about 1 1/4 cups. Heat and gently grease outdoor grill or indoor griddle to medium-high heat. When the grill is fully heated, place peach slices on top and grill just until scar marks appear (about 2 minutes per side). Careful not to overcook the peaches, they’ll become too mushy for this salad. Remove from grill, set aside to cool off a bit. 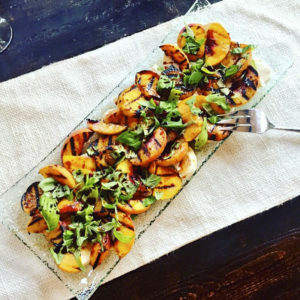 Layer the grilled peaches, mozzarella cheese, and snipped basil on serving platter; then drizzle with the vinaigrette dressing. Both sweet and savory, this salad pairs wonderfully with a glass of Chardonnay or 3. 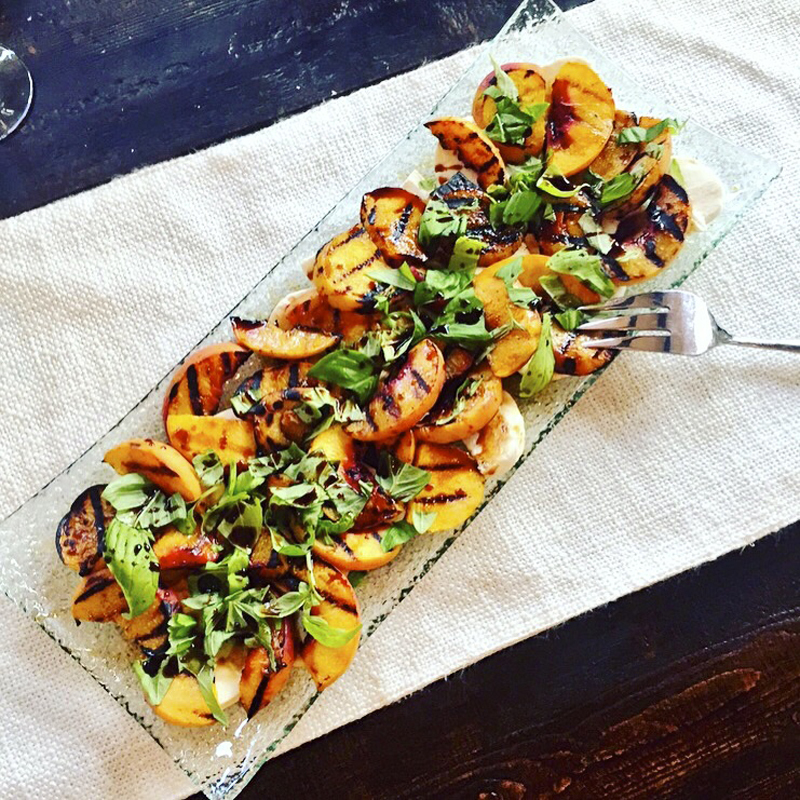 A Georgia peach inspired salad with mozzarella, fresh basil, and peach vinaigrette. In a small bowl, whisk all ingredients together until fully mixed; chill until ready to use. Wash and slice fresh peaches. Heat grill (or indoor griddle) to high. 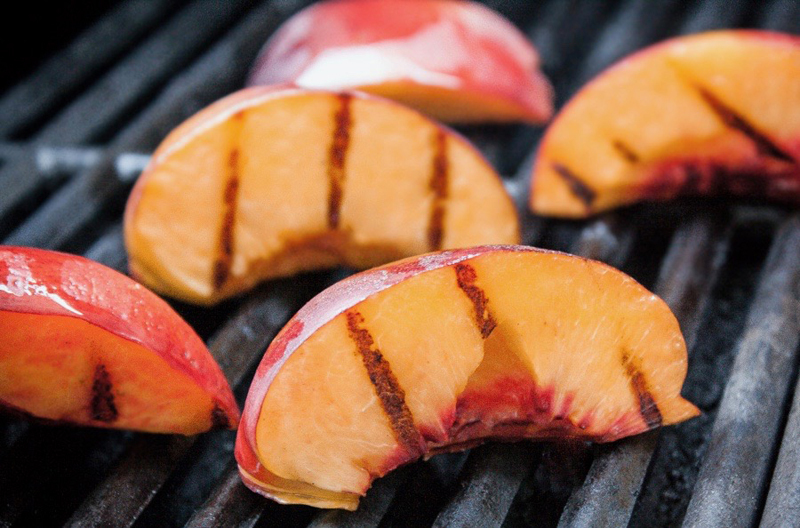 When grill is very hot, set peach slices on top and cook just until grill marks appear (about 2 minutes per side). Don’t overcook! Set peach slices aside to cool off a bit. Layer slices of grilled peaches, slices of mozzarella, and fresh basil leaves. Drizzle generously with my peach vinaigrette.